Happy National Ice Cream Day! I think it's perfect that this day falls on a Sunday. Sundays are for making (and eating) ice cream! A few Sundays back, I was having fun making shapes out of a watermelon, when I realized I'd have lots of very odd-shaped pieces leftover. I figured I could puree it into a drink, or, put our ice cream maker to good use and make a sorbet. Husby's vote was for the sorbet. 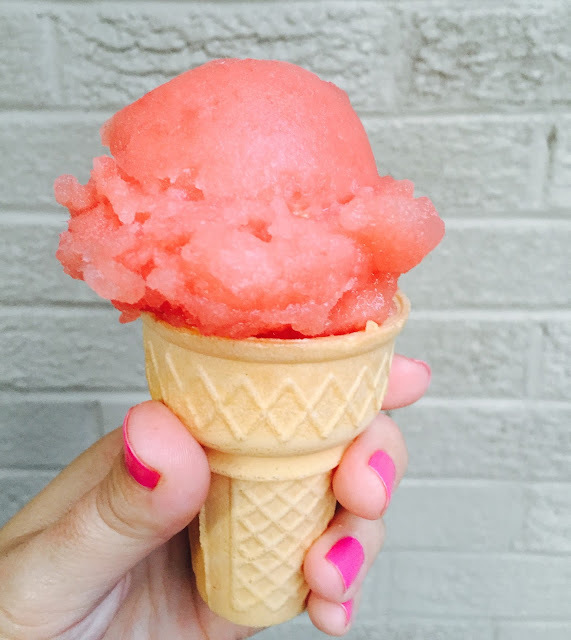 I searched online and was so excited to see Jeni's recipe for Watermelon Lemonade Sorbet! I discovered Jeni's just recently on a trip to Nashville with my mom and Parker. They are found in just a handful of cities across the country, and they are pretty amazing. 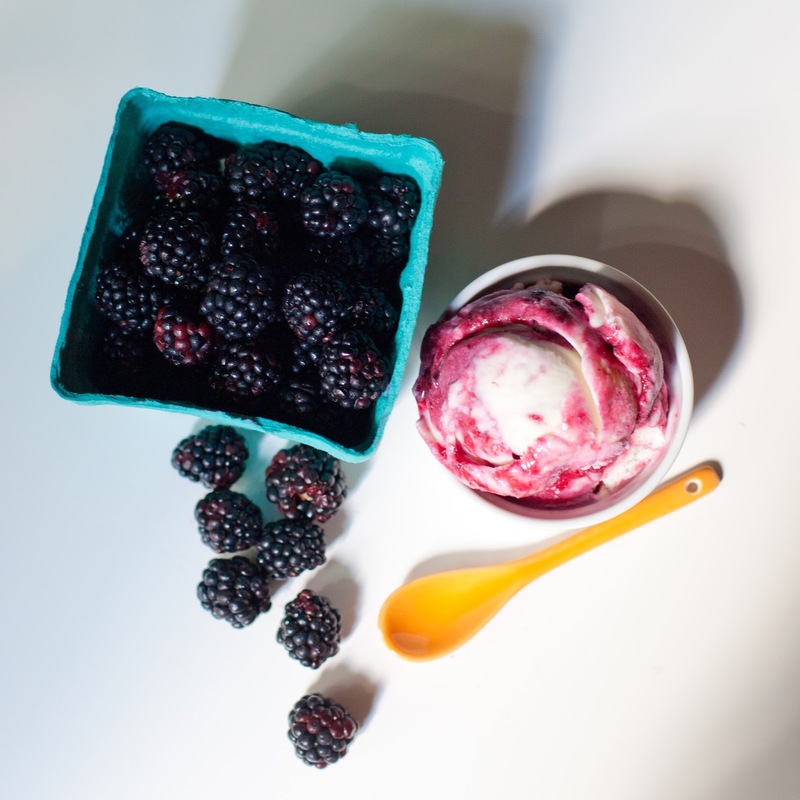 Jeni's is based out of Ohio; they use milk from local grass-fed cows, and take other nearby ingredients to make their flavors based on what's in season. No stabilizers, dyes, or shortcuts, just incredible ice cream. 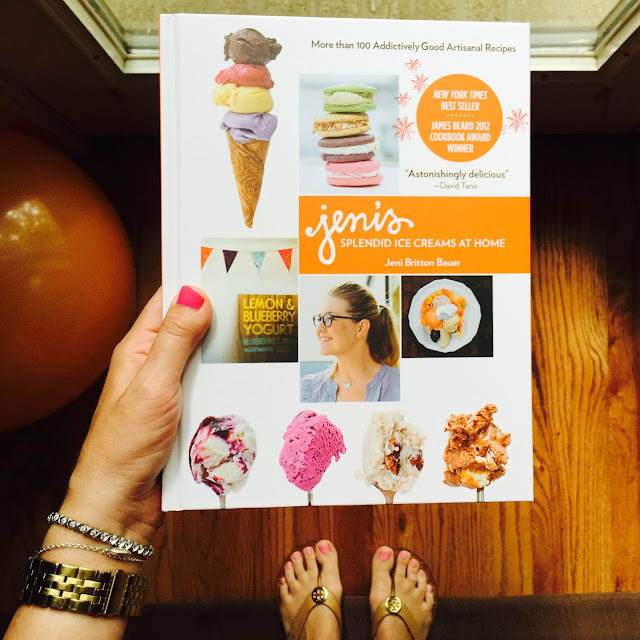 I was super excited at the thought of making Jeni's ice cream at home!! The ingredient list was short (watermelon, lemon juice, corn syrup and sugar) but the process was a bit involved, including cooking and chilling the watermelon mix before it could be spun in the ice cream maker. Once it was going, though, it was so nice to sit back and and think how perfectly summer and perfectly Sunday it was to be making ice cream. I even added mini chocolate chips to part of the batch - they looked a bit like watermelon seeds, but much tastier! With the success of my watermelon sorbet, I wanted more Jeni's. The Nashville store is an hour and forty-five minutes from our house, which seemed a bit excessive for ice cream (though that's not out of the realm of possibility for what I'd do for ice cream). Anyway, instead I found her original ice cream book on Amazon and in two-days, Jeni's Splendid Ice Creams at Home was here! OMG, y'all. This. Book. I may or may not have slept holding it that night. It's full of amazing combinations, ideas for sundaes, and even has a section on each season and which flavors highlight the tastes of that time of year. It made me want to make ice cream every day (not just on Sundays), but I held out until the weekend. The following Sunday, I made the plain Jeni's Ice Cream Base (also found here - it includes cream cheese!) and decided to mix and match by incorporating her recipe for Blackberry Sauce (since those are in season and our house was full of local ones). While the ice cream mix was chilling, I simply took 2 cups of blackberries and boiled them on the stove with a cup of sugar for 5-8 minutes. I let the mix cool, then forced the sauce through a sieve (this was the hardest part, put it was nice to get rid of all those blackberry seeds!). Here's a little tip I learned from the book: the sauce doesn't go directly into the ice cream maker. 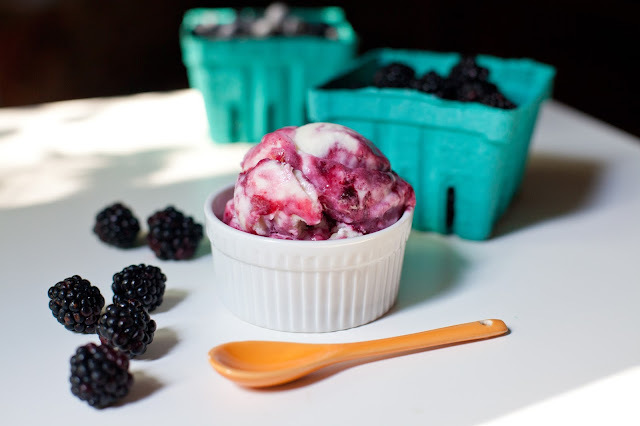 Instead, once the ice cream has been spun, scoop it into a freezer-safe container and pour the sauce in between layers. I was skeptical, but look how beautifully marbled it turned out!